Create email brochures of your properties in just three clicks. 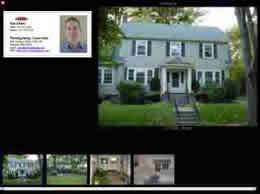 Create web-based slideshows of your properties in seconds. Make documents easier to email and share by reducing/resizing groups of photos and inserting them into your selling document templates. 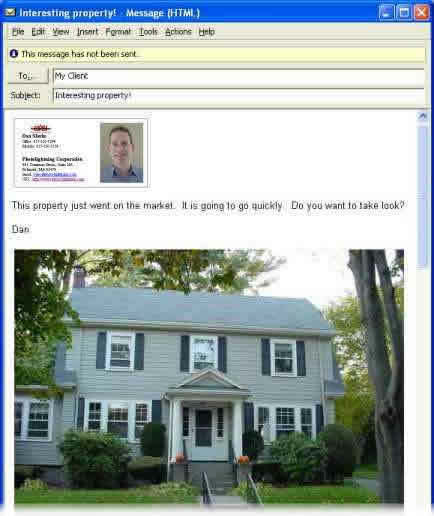 Photolightning is simply the fastest, easiest way for Real Estate professionals to use the power of email to generate more business. Using a simple, three-step process, Photolightning can AUTOMATICALLY create photo emails like the one shown below. Photolightning automatically reduces photos for you and places them directly into the body of the email - no more annoying attachments to worry about. Place a copy of your business card right into the email. The Photolightning software can nike heels italia create a business card for you (as shown below) or you can use a scanned image of your existing business card. Smaller photos mean faster upload times for you and faster download times for your clients. A five photo email can be sent in under one minute. Use Photolightning to email MLS photos that you have downloaded to your computer. Photolightning can automatically copy photos from your camera onto your computer for quick emailing. Photolightning also has many other great features such as photo printing, photo searching (it has a lightning fast "thumbnail" browser), and much more. If you need to use digital photographs for your work, but don't have the time or the inclination to spend hours on your computer trying to do so, then Photolightning is for you. Use Photolightning to create slideshows to post to your web site or email to clients. 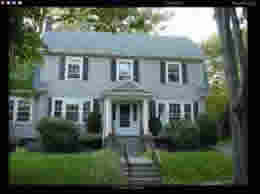 Al it takes is a couple of clicks and you can create informative slideshows of your properties, like this. Photolightning automatically reduces your photos so it is easy for your clients to view them. Clients can even view them FULL SCREEN without waiting for long downloads. Place a copy of your business card right into the slideshow. The Photolightning software can create a business card for you (as shown below) or you can use a scanned image of your existing business card. Photolightning's built-in web publishing software (better known as ftp to some experts) makes it a snap to publish your slideshows. Each slide show has three ways for your clients to view each property - full screen slideshow, filmstrip, and thumbnail view. If you use Microsoft® Word to prepare selling sheets, then Photolightning can you save you a lot of time. Simply open the photos you want to place into the template documents, and tell Photolightning to replace every occurrence of '<photo>' in the document with a picture. It's that easy. 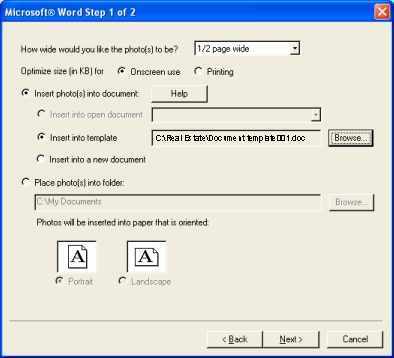 In one click, you can reduce, resize, and insert multiple photos into your documents.